Our servers preform server-side spam filtering automatically. Sometimes it is possible that a sender who had sent email to you in the past is suddenly being blocked or listed as [BULK] or [SPAM]. This likely has to do with the ever changing environment with email servers and the traits that real spammers use. The recommended way to prevent legitimate messages from being blocked or classified as spam is to add them to your Whitelist. It is an easy process and will ensure that their messages always make it through to you. Go under "Settings" then "My Spam Filtering"
Read the instructions and enter addresses and domains that you wish to always receive email from. Locate the email from the sender email address that you do not want quarantined in the future. Click on the word "Whitelist," which is in green print to the right of the email title. This will open your list in a web browser. 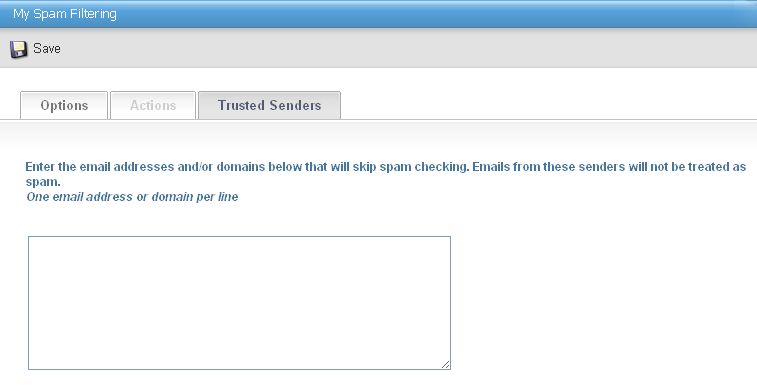 Choose "Sender Domain Block/Accept." Enter the domain name you want to whitelist. For example, you can enter aol.com to allow all AOL addresses. You may enter a comment to remind you why you allowed this domain. Click "Add." Click your mouse on the "Email Sender Block/Accept" tab. Enter the email address of an individual sender that you want to whitelist, such as "jsmith@aol.com." Include a comment. Click "Add." In the future, Barracuda will not block emails from this sender. You may adjust your settings here or Whitelist specific addresses or domains. You may also log into your Plesk hosting account at www.dytek.net to review your emial settings in greater detail.